There is valuable space in the settee lockers of a pocket cruiser such as the Ericson 25, but only if you make the most of this space by providing easy access to it and cleaning up the rough fiberglass. In this posting, I describe my thoughts on the cutting of access ports to the settee backrests and my work on the deburring of the existing settee lockers beneath the settee seats. From what I could tell, there was a lot of wasted space behind the settee backrests. The settee backrest cushions were secured to the settee backrests with stainless steel screws. The heads of these screws were hidden by the folds in the roll-and-tuck upholstery of the backrests. I looked around online for other Ericson 25s whose owners might have created storage space behind the settee backrests. In the picture above we see an Ericson 25 with oval cutouts in the settee backrests. I liked these oval cutouts much better than some of the square cutouts that other owners of other types of boats had made. Curves, of course, are much more appealing to the eye, especially on a boat. Still, though, I had to figure out for myself how large to make these oval cutouts and where exactly I should place them. After a lot of measuring, a lot of feeling around with my hands, and some blind guesswork, I made a jig that would help me make these oval cutouts as symmetrical and as balanced as possible. At the same time, I wanted to clean up the many burrs and rough edges in the existing settee lockers. I didn't want anything snagging my hands (or the Admiral's hands) when reaching into these spaces. Above and below we see the mess that was in the port side forward locker. My Dremel with a right angle attachment and a sanding drum made this work not very difficult. It did, though, stir up a lot of dust. The bulkhead pictured above and below is the one that defines the hanging locker amidships. 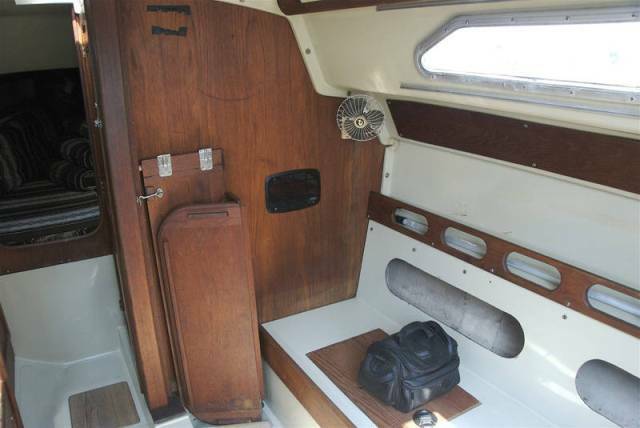 In this port side forward settee locker (pictured above) I would eventually stow my cast iron 3 quart pot and canned goods when cruising. After I finished this work, I turned around and focused on the aft end of this port side forward settee locker. There were some nasty burrs here. The tabbing on the bulkhead that separated this forward locker from the aft locker on this port side of the boat had some vicious, needle-like pieces of fiberglass projecting from it. Above we see a before shot, below, an after. Satisfied, I began to work on the aft locker on this port side of the boat. This is where I would eventually stow my tools bags, and I can say now, after three years, that not once have I injured my hands in my frequent digging around in this space for tools. I found razor-like burrs . . .
. . . and more needle-like projections. My Rockwell Sonicrafter oscillating tool helped to bring this stuff under control. Below we see an after picture. Above and below we are looking aft, toward the galley stove cabinet. With this handheld work light in the stove cabinet space I was able to get some sense of the space available behind the backrest of the port side settee. I definitely wanted to take advantage of this space. Now I was ready to focus on the starboard side settee lockers. This forward locker is where I would eventually stow miscellaneous items such as an extension cord, a corded work light, a bicycle pump (for the fenders), waterproof plastic organizers with stainless steel screws and nuts, and, among other things . . . at least one case of beer (unboxed) when cruising. When the weather was cool in the winter and spring this locker served as a natural cooler. In the summer it served simply as a staging area. Each morning I would move a few beers from this locker to the Engle fridge so they'd be icy cold in the afternoon. The last locker I tackled was the starboard aft one. This was where I would eventually stow my spare anchor (Lewmar 22 pound plow), my spare 30 foot 5/16 inch chain, and my 200 foot 1/2 inch nylon anchor inch. Here also I would stow spare anchor lines and extra lines of various types and sizes. Above we see the old and undersized and worthless VHF coax cable. This ends this posting on my analysis of the backrest settee spaces and my deburring of the existing settee lockers in Oystercatcher, my Ericson 25.